Bring on the trends for the year of 2019! 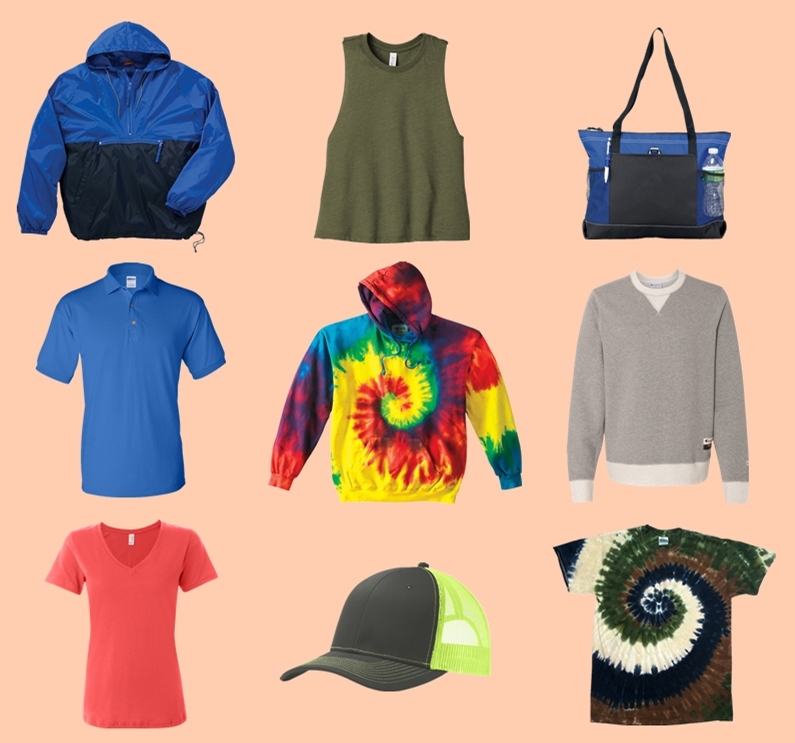 From softest tees and fleece sweatshirts to lightweight jackets and stylish hats, our list is carefully picked to show off the best of the best. No matter what your are looking for, NYFifth has got you covered. Stay comfy all summer long in 2019 with our favorite tees – Champion Cotton Tagless T-Shirt and Tultex Unisex Poly-Rich Blend T-Shirt. 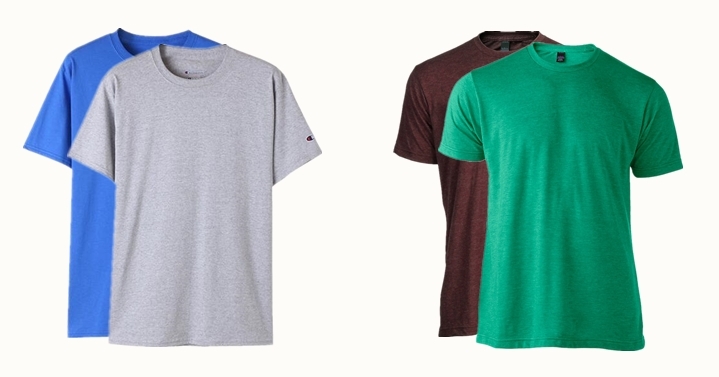 The Champion T525C is made with 100% preshrunk heavyweight cotton for softness and comfort. This blank tee with high density stitch and quality construction is ideal for printing. The Tultex 0241 is extremely soft thanks to its blended, polyester, cotton and fine knit jersey fabric. Both are available in 10+ colors for you to choose from. The top two sport shirts for 2019 are going to work well for you in the office, on the golf course, at corporate events and more. The Gildan DryBlend Jersey Knit Sport Shirt is a terrific style for men and women. DryBlend technology delivers moisture-wicking properties. Made with 50/50 cotton/poly jersey knit fabric, this jersey shirt will retains its color and shape washing after washing. The Port Authority Ladies Silk Touch Performance Polo wicks moisture, resists snags and thanks to PosiCharge technology, holds onto its color for a professional look that lasts. 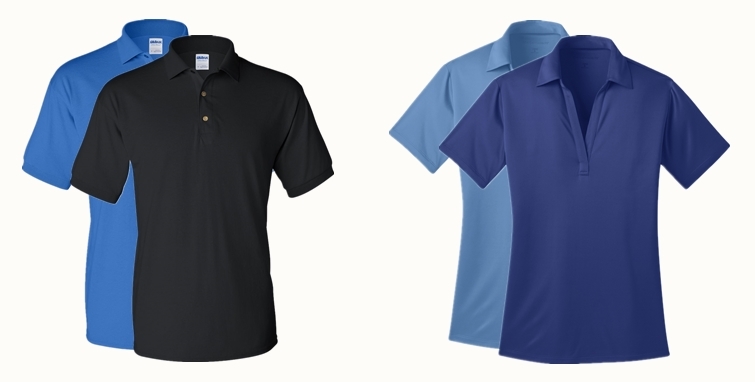 It’s great to add your logo to our sport shirts as company uniforms or corporate gifts for the upcoming events of 2019. Tank top is a must-have piece for your 2019 wardrobe, since it can be easily layered with all kinds of clothing. 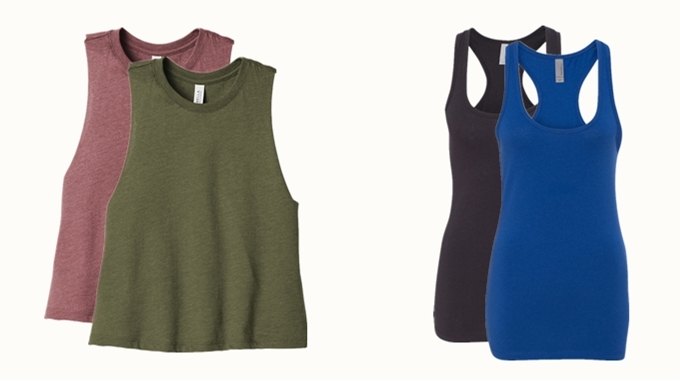 We picked two of our favorite tank tops for you to choose from. The Bella + Canvas Women’s Racerback Cropped Tank has a relaxed fit. It’s easy but fashion to pair with any bottom, whether jeans, shorts, or skirt. The Next Level Apparel Ladies’ Jersey Racerback Tank is soft and comfortable thanks to its ringspun cotton, polyester, and spandex jersey fabric. It’s a great company for your workout. 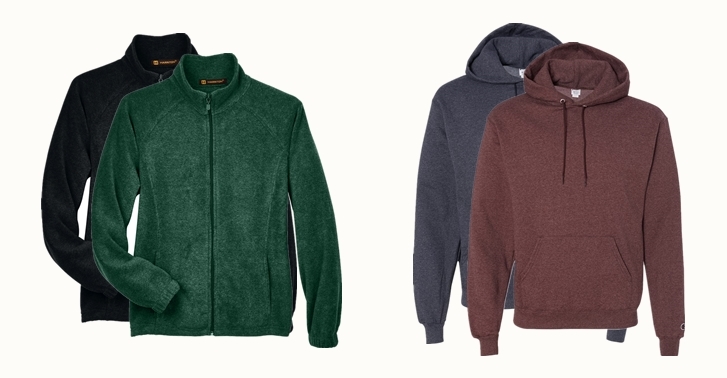 Stay comfy and warm at cold days in our top two fleece jackets and sweatshirts for 2019. Our fleeces are great for layering, traveling light or to wear everyday. You probably cannot find a better full-zip fleece than the Harriton Women’s Full-Zip Fleece for a lady. It’s made with 100% spun soft polyester fleece with non-pill finish on surface for softness and comfort. The Champion Double Dry Eco Hooded Sweatshirt offers Double Dry fabric to wick moisture away and a full athletic fit for maximum comfort. It’s made with up to 5% recycled polyester from plastic bottles. Lightweight jacket is an essential for 2019. The Harriton Packable Nylon Jacket is your first choice. It’s made with 100% nylon taffeta wind-and water-resistant fabric to help you keep warm and dry while enjoying spring weather. This packable jacket is also easy to carry with you while traveling. The Storm Creek Men’s Quilted Thermolite Jacket will protect yourself against cold, damp days without sacrificing comfort thanks to its water resistant and windproof fabric. This lightweight jacket made with fine Denier Polyester is soft to the touch. It’s a little hard to pick just one winner from so many stylish hats, but we think you’ll love our top two for 2019. The Port Authority Snapback Trucker Cap is great for logo embroidery or printing. It features breathable mesh and contrast stitching on the bill. This performance trucker cap is perfect for sports, traveling, or corporate events. The OTTO Cap Vintage Washed Cotton Twill Dad Hat has a vintage look thanks to its heavy stitching distressed trim edge visor. Features include 100% cotton, six panel, low profile, unstructured, soft crown, and low-fitting, this dad hat will help you to keep cool and stylish in 2019. Bag is a must-have for your everyday life, so we picked top two for 2019. 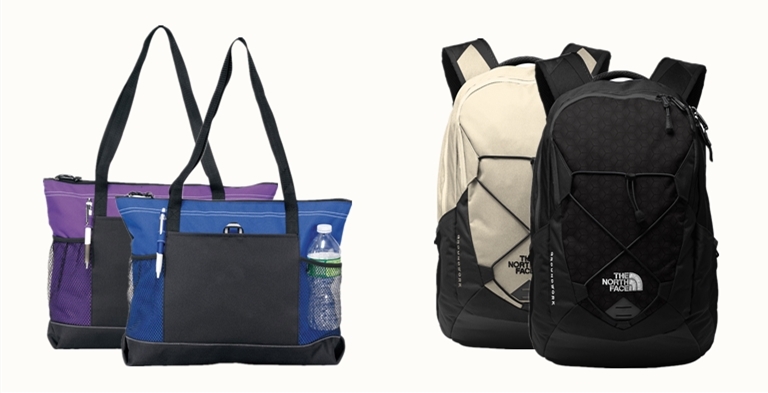 Zip up whatever you need in the Gemline Select Zippered Tote and be on your way it even has a place for your pen and witer bottle! With front pocket center imprint area, this custom tote bag is great for work or corporate event. Go back to school, off to work, or out adventuring with your essentials neatly stowed in The North Face Groundwork Backpack. It is a perfect backpack to transition from a busy week at the office to taking a hike in the great outdoors. It’s great to get your company logo embroidered on the backpacks as corporate gifts for your clients. The wave of Champion ran from 2018 to the new year and will continued on. While you don’t have to worry about the trends and quality of the Champion products at all, we’re going to introduce the Champion authentic line to you. From triblend varsity tees and french terry joggers to sueded fleece sweatshirt, Champion authentic collection is great for everyday wear without sacrificing comfort and style. With old-school style, Champion authentic products are perfect for students to customize for school spirit gear. Tie dye, bright colour, it was never out! In the world of 2019 fashion trends, tie-dye has made a serious comeback. From tie-dye tees and tie-dye sweatshirts to tie-dye blankets and tie-dye drawstring bags, we promise you’ll see tie dye products everywhere in 2019. The Pantone Color of the Year 2019 is Living Coral! We’ve pulled some of our favorite products in a bright coral shade for you to choose from, like bucket hat, beach tote, and short sleeve tee. No matter what you’re looking for, NYFifth has got coral covered.